1. Four Model Types are supported: Single Aileron, Dual Ailerons (Flaperons), Delta-Wing and V-Tail. a. Standard/Rate Mode: Gyro will make the corrections for stabilization. b. Hold Mode: Gyro will be standing by for calibration. c. Gyro ‘Off’ Mode: Gyro is disengaged and total control is given to the transmitter. 3. 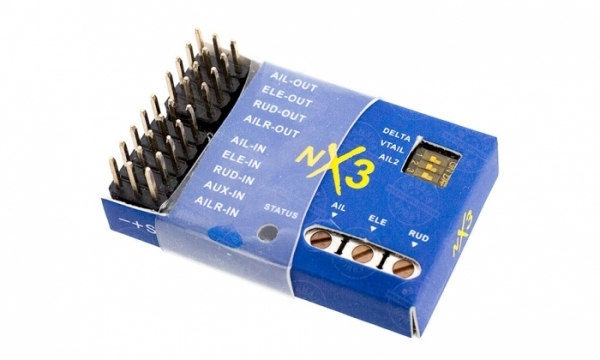 Two kinds of Gain Control Methods are supported: ‘Master Gain’ for the radio and ‘Independent Axis Gain’ from the Variable resistor on the NX3 board. 4. Using the gyro’s superior algorithm, the gain control options can be configured to a comfortable or more sensitive sense of control depending on your preference.